Atlantic herring are small pelagic fish, typically found in large schools (i.e., 1,000s of individuals). These fish are found offshore and in the major estuaries from Gulf of Maine to Chesapeake Bay. Herring are very versatile fish; in addition to being sold fresh and frozen, they are often also pickled, smoked, preserved in oil, or salted. Overall, management of the Atlantic herring fisheries is highly effective. These fisheries are limited access, where the number of vessels that can participate in the fishery is capped at a certain level based on historical participation. Data are readily available, and the fishing limits are set based on ongoing stock assessments. Understanding and monitoring the impacts of herring fleets on other species is of equal management concern and attention. Atlantic herring have a short lifespan and high reproductive rate, which makes them quite resilient to fishing pressure. The mid-water trawl and purse seine fisheries only target mature fish, and as a result the stock is currently healthy and not overfished. Little bycatch is caught in the herring purse seine fishery due to the selectivity of this gear type. Bycatch species caught by the herring trawl fishery include haddock, river herring/shad, and Atlantic mackerel; these fish are often kept. 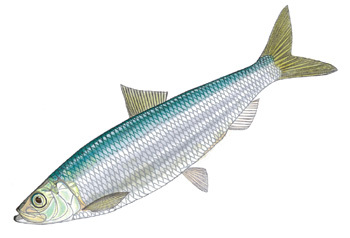 The primary bycatch concern is for river herring (alewife and American shad), which are considered species of concern due to their status as depleted and overfished. Occasionally marine mammals are caught in trawl gear, however this happens relatively infrequently and mortality is low compared to other fisheries. There are ongoing management efforts to limit bycatch and improve fishing practices. Purse seines do not make contact with the ocean floor. As such, they have the lowest possible impact on the benthic environment. Mid-water trawls do occasionally contact the bottom, if this does occur, it is usually in a place covered largely by gravel and silt. Thus, this gear also has a minimal impact on the seafloor. Pacific herring are a small pelagic schooling fish. Active commercial fisheries for Pacific herring exist in Alaska, Canada and California. In California, Pacific herring are harvested as whole fish as well as for their sac roe. Landings in the US in 2012 were worth $19.9 million, and most product is exported to Asia. 69% of all herring species in the US is from Canada. Pacific herring have life history characteristics that make them resilient against fishing pressure such as a short lifespan and high fecundity. Their abundance typically varies with environmental fluctuations. Currently, a stock assessment is underway for the California herring fishery but is not yet available. Quotas are based on annual spawning surveys. Fishing mortality has remained below established quotas. Based on spawning information, abundance has increased since 2008, and the stock is not thought to be overfished. The Pacific herring fishery is managed by the California Department of Fish and Wildlife and the California Fish and Game Commission. Surveys as well as fishery-dependent data are collected. The quota in California is currently set at 20 tons. Management is moderately effective, as fishery-independent surveys are yet to be established and the importance of herring in the ecosystem is still being explored. As bottom gillnets make contact with the ocean floor, they have the potential to damage parts of the habitat such as algae and seagrasses. However, the fishery operates mostly on muddy bottoms and the small scale of the fishery has limited effects on the habitat. More information is needed on impact of removing Pacific herring from the ecosystem. Little bycatch is caught due to the selectivity of bottom gillnets, as well as the fact that the Pacific herring season coincides with a period of high freshwater levels when the salinity is too low for most other species. Bycatch species occasionally caught include jack smelt and Pacific sardine, neither of which are species of concern. Pacific herring are found in several areas of British Columbia. Those covered in this report are: Central Coast, Prince Rupert, Strait of Georgia, Haida Gwaii and West Coast Vancouver Island. Herring are harvested for their roe, for spawn on kelp, as well as food and bait. Most herring are exported to Japan and China, with smaller amounts to the US. Roe was the primary product in total catch and wholesale value in 2012, and spawn on kelp was the most valuable product per unit basis. Pacific herring have a short lifespan and high reproductive rate, which makes them quite resilient to fishing pressure. The population status has been healthy for the past two years. Of moderate concern is the fishing rate due to the fact that several stocks have only recently rebuilt, and the rebuilding was slow. The Department of Fisheries and Oceans opened the Central Coast, Haida Gwaii and West Coast Vancouver Island commercial fisheries for the 2013/14 fishing year. These areas had previously been closed to commercial fishing for almost 10 years and had only recently recovered. It is uncertain if the allowable fishing quota was set too high. It is of concern that management opened these commercial fishing areas despite science-based advice from herring fishing managers to keep them closed. Purse seines and gillnets do not make contact with the ocean floor. As such, they have the lowest possible impact on the benthic environment. Little bycatch is caught in the herring purse seine fishery due to the selectivity of this gear type. North-East Atlantic (ICES divisions I, IIa and IIb, V, XIV). North East Atlantic ICES Areas VI, VII, IVa. ICES divisions IV a, b, c, and VII d.